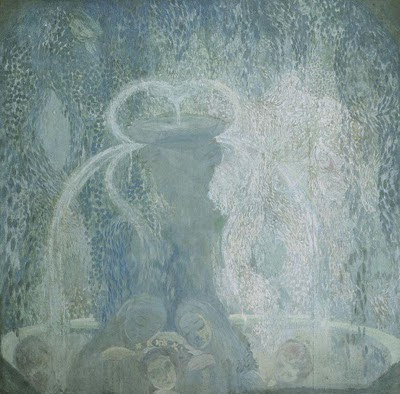 His early works are beautifully suggestive, he characterized them as 'intuitive symbolism', as here in 'Blue Fountain'. Where a fountain nourishes gathered forms at its base, female forms attending a child, baptized in watery light, lighted water. Even with a limited, muted palette, he demonstrates a mastery of colour that was to develop to a fullness in time. 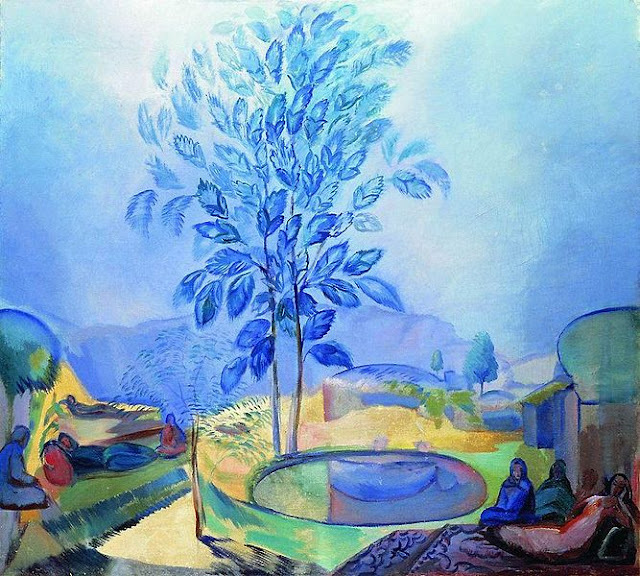 There remains a level of the indistinct, the not shown, the figures have only the elements of faces but this nomadic scene of oasis shares the same emphasis on the nourishment of water, heightened to an intensity of the magical by the blue tree cast in moonlight and a general vibrancy of colour. It is a beautiful art and has a wonderful aura of calm: of things in their places, of the domestic round considered and enacted in timeless rhythms; and, because of this something yet other being brought into being, or shown as being. This is a wonderful post and such dreamy art works, thank you for sharing. I got to know his works when I lived in Moscow. He is a marvelous painter, who was able to 'hide' his symbolism within his Central Asian paintings of everyday life in order to live (relatively) unscathed through the imposition of 'Soviet social realism'!